How do you decide which brownies to make with so many chocolate brownie recipes out there? First, decide what style of brownies you desire - cake-like brownies, chewy brownies, or fudgy brownies. Next, look for a recipe for brownies with history, a brownies recipe with a track record of proven success. That's where this homemade cocoa brownies recipe straight from mom's old recipe box comes in. These easy-to-make homemade brownies date back to our childhood. This particular recipe comes from the back of a Hershey's cocoa container and produces a delicate and chocolate cake-style brownie that my mom says never failed her. 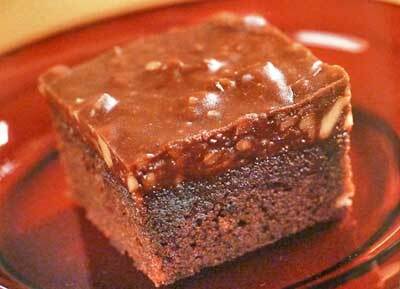 Consequently these brownies, referred to as honey bear brownies, appeared in our lunch boxes frequently during the 1970s. If you like cake-like brownies, we hope you give this old-time family recipe a try and savor the mouthwatering aroma of freshly baked chocolate brownies that will fill your kitchen. Your family and friends will thank you. Nothing says love like freshly baked homemade chocolate brownies! I have slightly modified the original recipe for brownies with cocoa - using butter instead of margarine. And like me, if you are not a fan of corn syrup, you may want to give organic rice syrup or honey a try as a replacement for a lusciously updated version of these old-time brownies with cocoa. These chocolate brownies are especially easy to make since the recipe calls for cocoa instead of melted chocolate. Lightly grease a 9x9-inch baking pan and set aside. Blend in syrup, vanilla and eggs. Combine flour, cocoa powder and salt and add to the liquid mixture. Pour the chocolate brownies batter into the prepared pan spreading evenly. Bake 25 to 30 minutes or until they begin to pull away from the edges of the pan and spring back when gently pressed in the center. Cut your cake like chocolate brownies into desired size and shape and enjoy! The original recipe for Cocoa Brownies may have been taken from a Hershey's unsweetened cocoa powder container somtime in the 1970s. If you like chocolate, you'll enjoy these moist and cake-like brownies with maple icing. The maple syrup in the icing gives nice and subtle undertones - but be careful not to use maple-flavored syrup! It is best to use pure maple syrup in this brownie recipe. Lightly grease a 13x9-inch baking pan, or use a non-stick pan, and set aside. In a large mixing bowl, sift together the flour, baking soda and salt. In another mixing bowl, whisk together the light brown sugar, sour cream, eggs and vanilla extract until thoroughly combined. Heat 1/2 pound butter with water and 1/4 cup cocoa powder in a saucepan over medium-high heat. Bring to a boil. Immediately pour boiling mixture into the mixing bowl over the sifted dry ingredients, then add the sugar and sour cream mixture and mix well until thoroughly combined. Transfer the brownie batter into the prepared baking pan and spread evenly using a rubber spatula. Bake on the center rack in preheated oven for about 24 minutes, or until a toothpick inserted in the center comes out clean. Remove pan from oven and set on a wire rack while preparing the icing. Toast the walnuts on a baking sheet in preheated oven for 8 minutes. Cool walnuts to room temperature before finely chopping them in food processor, or by hand. Combine the confectioners' sugar and chopped walnuts in a large mixing bowl. Heat 1/4 pound butter with the heavy cream, maple syrup and 1/4 cup cocoa powder in a saucepan over medium-high heat. Bring to a boil. Immediately pour the boiling mixture in the bowl with confectioners' sugar and walnuts; whisk to combine. Pour the icing over the baked cocoa brownies and spread evenly. Allow frosted brownies to stand for 1 hour before cutting. For clean cuts, heat the blade of a serrated knife under hot running water and wipe dry before each cut. Serve brownies immediately or store in an airtight container.